US President Donald Trump said on Friday he looked forward to finalising a post-Brexit trade deal with Britain, marking an abrupt change from a newspaper interview when he said Prime Minister Theresa May‘s strategy would kill such an agreement. In an interview published just hours before the two leaders held talks, Trump chided the “very unfortunate” results of the prime minister’s proposals for Brexit and her negotiating tactics as Britain prepares to leaves the European Union in March next year. However, Trump later said May was doing a “fantastic job”. “Once the Brexit process is concluded and perhaps the UK has left the EU, I don’t know what they’re going to do but whatever you do is OK with me, that’s your decision,” Trump told a press conference with May in the garden of her official country residence Chequers. Last week at the same location, May finally won agreement for her Brexit plans from her cabinet but within days two senior ministers had quit, departures which Trump said earlier in the week had left Britain in turmoil. Hours after those proposals were formally published, Trump cast further doubt on the strategy, delivering a withering verdict in an interview with the Sun newspaper. Asked about that interview, Trump said he did not criticise the prime minister and was gushing in his praise of his host, saying she was tough and capable. May, likewise, glossed over the comments. May and Trump both spoke of the importance of the “special relationship” between their two countries, something that Brexit supporters hope will reap benefits when Britain leaves the EU, allowing it to forge closer trade ties with the world’s biggest economy. “I would say I would give our relationship in terms of grade the highest level of special,” Trump said. However, many have cast May’s “business-friendly” plan as a betrayal that would leave Britain too close to the EU, including lawmakers in her deeply divided Conservative Party who have warned that she might face a leadership challenge. During the press conference, May also thanked Trump for his support over Russia which Britain has blamed for a nerve agent attack on a former Russian spy in southwest England in March. Trump is due to meet Putin, who has rejected the nerve agent claims, at a summit when he finishes his four-day visit to Britain, and said he would raise the issue of reducing nuclear weapons. “It will certainly be something that we bring up and talk about,” the U.S. president said. 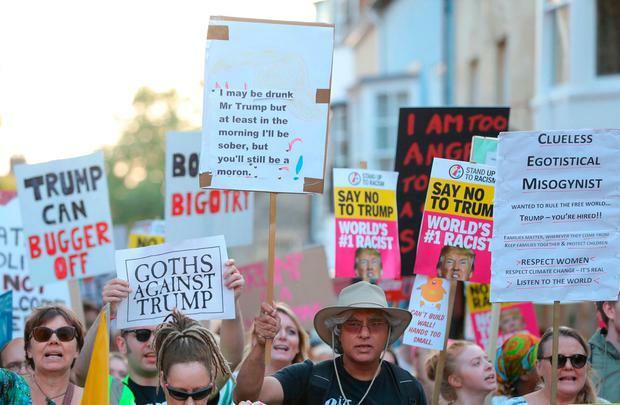 As Trump and May spoke, thousands of protesters marched against the president through central London, one of more than 100 demonstrations planned against the president during his stay. 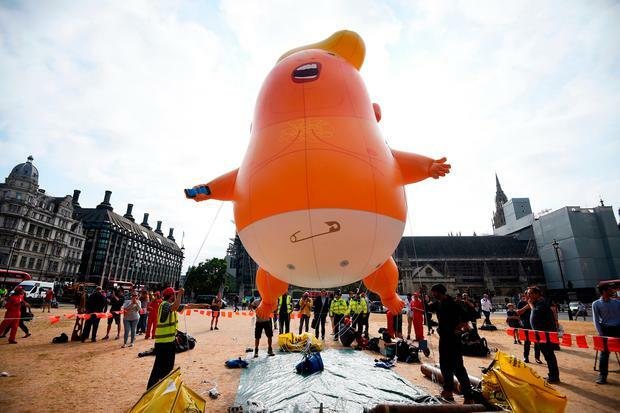 While Trump’s trip was not a full state visit, he has been given red carpet treatment and is scheduled to have tea later with Queen Elizabeth at Windsor Castle, where her grandson Prince Harry married U.S. actress Meghan Markle in May.